Stopped by Cycle Gear two days ago to exchange my back protector. The Back Space 2 just didn't fit properly and was raising up as I road and digging into my neck. I tried on the BAP 1, which was the one I originally liked, and it seemed not to slip up. I figured I'd try it on with a suit to make sure it fit well underneath, since the BAP 1 was a bit thicker than the Back Space. Last time I was here they didn't have the Alpinestars GPU suit (which I decided was the one I was probably going to get), so I figured I'd just try on a higher end Alpinestars to get the fit. Low and behold, this time they had the vented GPU in my size! I figured I'd be a 52, but after trying it on it seemed a bit large. Luckily they also had a 50, and it fit perfectly (that means I couldn't stand up straight, it was so tight...). I figured, "What the hell. I'm here already, and I've wanted it, so why not now?" And bought it as well. I also purchased some flush mount front turn signals. I figured it was about time to just pick something and install them. Also on that day, I received my air duct screens from SkyKing Products. They also sent me some commercials (stickers) that I definitely won't be putting on my bike. Today I figured I would install this stuff. The instructions for the screens were ridiculously detailed (3 pages!). However, I felt they weren't really the most accurate. They say to place the screens on top of the stock plastic covers and bend it to fit. That's good to start and get the general shape down, but once you have that you really have to do quite a bit of forming against the rear cowl. I started by screwing down one point and then forming it towards another screw, screwing down that one, then finally forming it towards the last screw. This seemed to work quite well. At first I wanted the screen flat, but after looking at it on the rear cowl I decided that bulged out it would match the lines of the bike better. Wow, no wonder the bike's leaning to the right. What a difference! 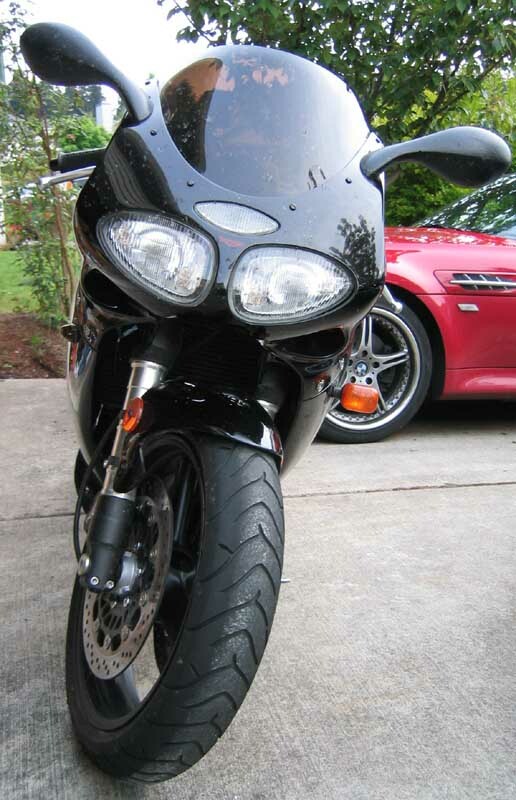 Really makes the bike look lithe compared to the stock honkin' thing. Today I finally washed the bike, and took some pictures of the screens and new turn signals. Both definitely clean up the lines of the bike! This is the way it should have been. 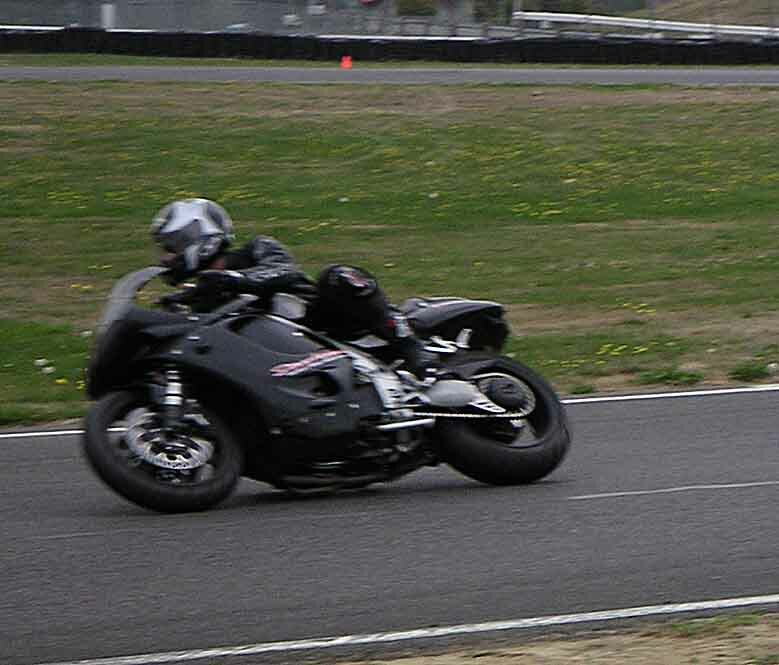 My first track day ever on a bike! 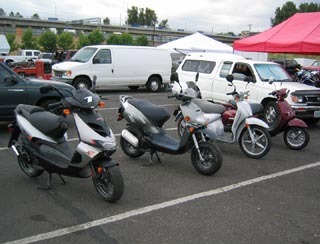 Naturally, at PIR. Conditions were perfect (temps in low 80s) and despite the Indy cars running a few days previous, the track was in good shape. I did not pre-register for the event (and it was full), but after talking to the right person was allowed to run (thanks!). My first session out I was a little bit nervous, but quickly got myself comfortable with the turns. Being on the track many times in a car certainly helped. The Rookie (C) group was pretty slow this first session, and despite me figuring I'd be passed by everyone I was only passed once, and did quite a bit of passing. After I pulled into the pits someone came over and started talking to me about the bike, and asking how I liked it. As I was explaining how much I like it he points to the oil reservoir and says, "What's that?" and I look and see liquid run marks on it. Was I leaking oil? I put my finger in it and it smells like gas. Gas? "Oh no not again?" 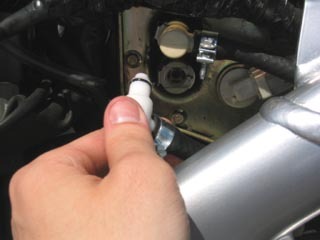 I removed the rear faring, turned the key and saw gas spraying out of the lower elbow joint connected to the gas tank! Are you kidding me? Anyone remember this story about the last time this happened in Newport? This time it was the other elbow (the return line). It wasn't spraying as bad this time, but still too much to ride. When this happened in Newport I said I would always carry a spare with me, but I never did get that spare. 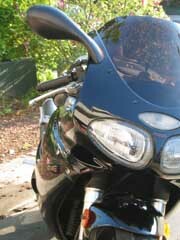 :-( I made some phone calls hoping somebody could stop by the Triumph shop and bring me a spare part. No one picked up the phones... I asked around at the track in case anyone had one (I think Ducati uses the same part), but no one did. 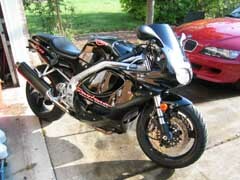 Dennis said if nothing else, he or I could take his bike to the Triumph shop at lunch and get it. He also threw in there, "Until then you're welcome to ride the Duc." I was a little hesitant at first, but when they called my session decided to go ahead and do it. The bikes are quite different animals.. Despite my bike weighing 6 pounds less, the 748 feels significantly smaller when you're on it. After the session I was milling around my bike when the guy who was parked in front of me said, "What happened?" I explained and he said, "Well you can take my car to get the part." WOW! I had never even met this guy before and he's letting me borrow his car. How great. I jumped at the chance and took off to the Triumph shop to get the part. Upon my return I quickly installed the piece and no more leaks. This time I really am going to order those metal versions like I always said I would. I wound up missing only one session, but there were only two sessions left once I got back to the track. 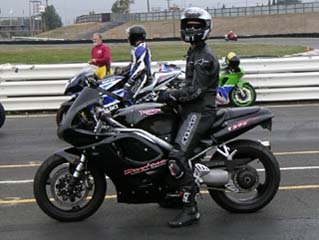 After listening to some pointers I tried harder to stay forward on the bike and keep the balls of my feet on the pegs. I succeeded in doing this, but I think a bunch of the people from group B were now also ridding in group C, because for my first session back on my bike I passed two bikes and was passed by everyone else. :-) Humbling. For my third session Dennis followed behind me with his helmet cam on. After watching the video I learned many things that I'm doing wrong. For one, my corner entry speeds are way low. I was slowing down way too much for the corners and then accelerating through them instead of just maintaining my entry speed. Also, while it feels like I'm moving around on and hanging off the bike for the turns, watching it (and comparing it to watching others), I'm hardly moving at all! The video really helps analyze and get better. So I'll have to try and start moving around more... we noted that I do have the bike leaned over in the turns as much as some of the others, but since I'm sitting so high on the bike (i.e. 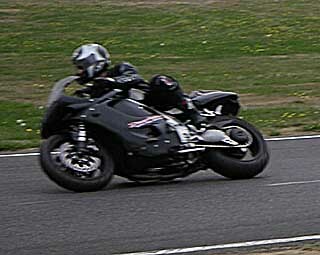 not leaning off the bike) my corner speeds are much lower than others with that (bike) lean angle. Things to work on... I'm here to learn, and I certainly learned today. My fastest laps with the camera behind me were 1:37. So in the M Coupe I'm 4 seconds slower than Dennis, and on a bike I'm 12 seconds slower. It's obvious which machine I'm more comfortable on right now. :-) I really look forward to the next track day to work on those things. Second track day of the year (and ever) at PIR. It was again put on by Moto Corsa. Today was an Aprilia demo day, and they had all kinds of fun machinery people could demo: two RSV Mille Tuono, two RSV Mille, a specially tuned Tuono "Clarkie" (130bhp), a RSV Mille R Edwards special, and a bunch of hip lookin' scooters. 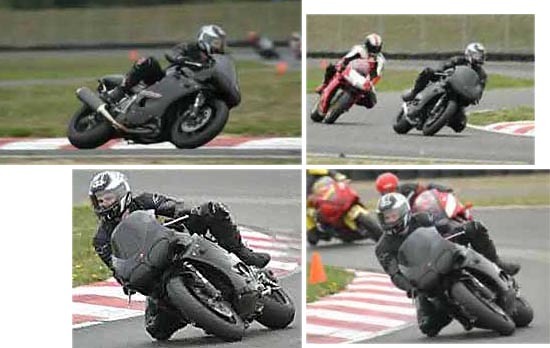 When watching the video from the last track day, I noticed that I wasn't hanging off the bike nearly as much as I needed to be. After that, I went on a few rides and tried to improve my technique. Naturally, one can only push so hard on the street, so I was anxious to see how much I improved for the track. I again signed up for the C group. I felt MUCH faster (when there wasn't traffic in front of me puting along). I dragged some toes several times... gotta work on keeping those in more. 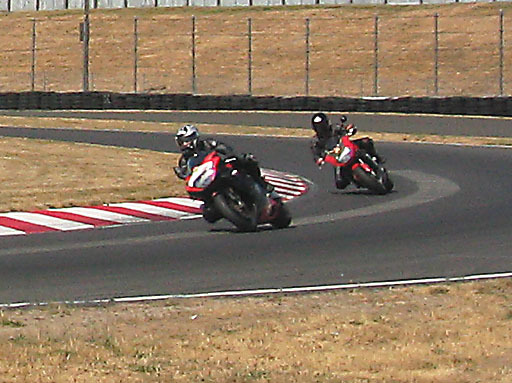 It also felt like I was dragging something ON the bike through turn 2 (later I noticed it was just after a slight bump). After the second session I noticed that it was the exhaust headers, which had some fresh scratches on them. Bummer... I guess I have to hang off yet more! Come the third session, I decided since I was really being held up by traffic in the C group I would switch to the B group. The pace was much quicker, and much more comfortable. Surprisingly, I was still doing most of the passing. Through turn 3, the only real left-hander on the course, I noticed something else hitting the ground and at first it startled me, but it was my knee! Cool. 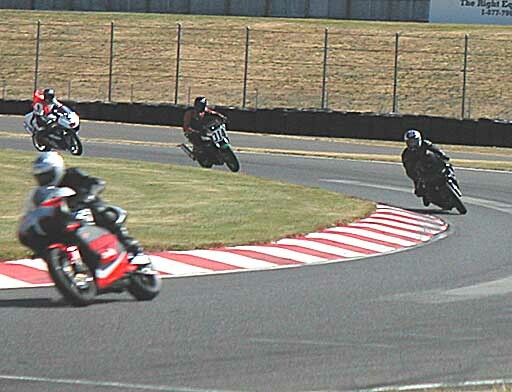 The rest of the session I was regularly putting a knee down in that turn. What a cool feeling! I guess I'm finally hanging off enough (to the left). I never once touched he right knee down, though. I guess I'm not as comfortable with right handers? I also dragged the headers a couple times, but not nearly as bad as I did earlier in the day, so I could still hang off a bit more on right handers. For some reason though, it's not as comfortable to do so. Another bummer is on the main straight, several times I missed the shift from 4 to 5, hitting a false neutral. Of course I'm really flogging it here, so after I shift I slam the throttle wide open, and the tach blasts past the rev limiter, way into the red. Crap. Throughout the day I tried to be extra firm with my shifts, but it still happened a few more times! I think I've heard of problems like this with the Daytona gearbox... hopefully I can figure out a fix (or just start really yanking up on that lever). I think it's always on the 4-5 shift because the added wind at 130mph makes it harder to yank on that lever. For the fourth session, second time in the B group, I was followed by my friend Dennis, who had a helmet cam on. After reviewing the footage, I was running 1:28's through some traffic. Unfortunately the tape ran out by the time he got behind me and the track cleared up! But I would certainly think that 1:26 laps were achieved when there wasn't any traffic. Pretty damn amazing, really... 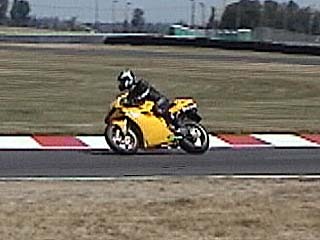 I improved about 11 seconds on my lap times from the last track day. I went from being an average rider in C to being one of the faster guys in B in one day. Pretty quick learning curve for me. Thanks a bunch to Dennis for giving me all the pointers. After my 5th and final session with my bike (last three in B group), which totaled 115 miles, it was time to ride the Aprilia RSV Tuono in the C group (didn't want to waste a B group run on my bike). I wanted to sign up for the Mille, but by the time I got around to signing up they were all taken. Fortunately, when I went to get on the bike there was still a Mille sitting there. I asked the guys, "Can I just take the Mille instead?" And they said sure! This bike feels weird. The bike looks massive (one thing I never liked about it), but when you sit on it your legs are very close together! The tank is really wide, but the lower half of the tank, where your legs go, is actually very narrow, so it gave the impression of a much smaller bike (just sitting on it). Once you start moving, the bike feels its size. The first few laps there was quite a bit of traffic, but after that things opened up a bit. The engine was very smooth, and pulled almost as hard as my bike on the straight. It has a digital speedo that certainly seemed more accurate than mine, so a quick look down and I could see the speed I was hitting on the front straight (150mph+), which felt almost what I do on the Triumph. The bike had the stock pipe on it so it was pretty quiet... I'm use to hearing my engine more, so I wasn't as sure of where I was in the RPM range with this bike... but it was geared similar to the Daytona, with a similar red-line, so it wasn't too hard to get use to. 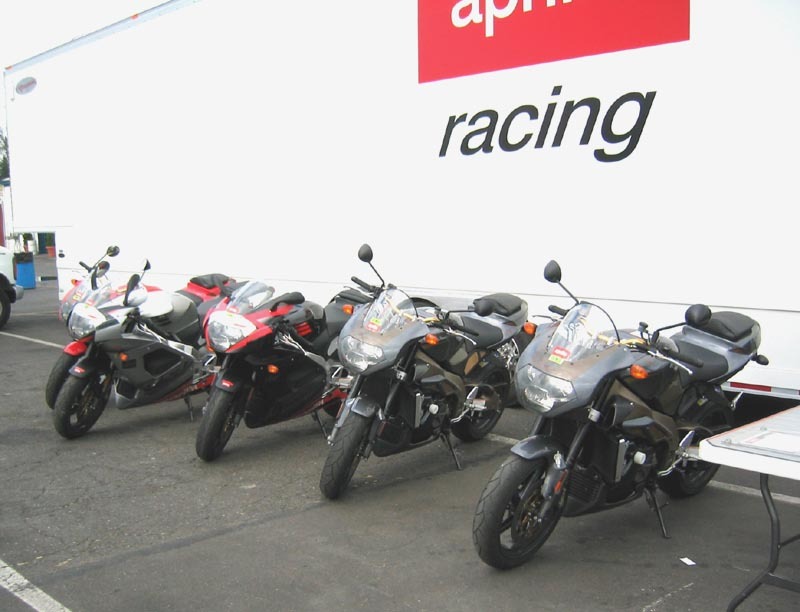 Once up to speed, it seemed as if it was harder to move around and hang off of this bike than the Triumph, but that certainly could just be because I'm use to my bike, not the Aprilia. I got moving pretty quickly on the Mille, and towards the end of the session I was blasting down the back straight, gaining on another bike. I figured I had enough room to pass him on the outside before turn 7, but as I was doing so he started moving to the right, towards me, pushing me towards the wall. Normally riders move to the LEFT, into the turn... not sure what this guy was doing, but it put me in a bad place... I was cookin' pretty good, but way too wide. I should have been on the left of the track for the left hander, but was way over on the right. 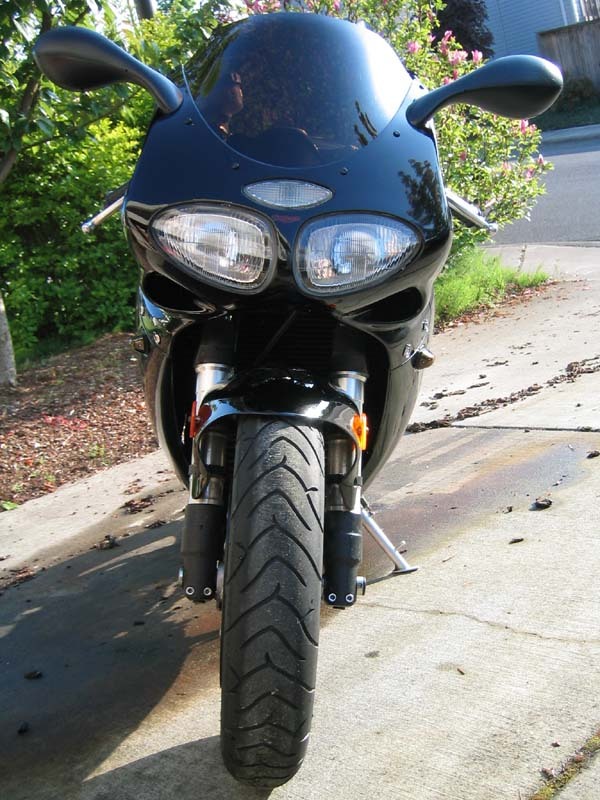 I could have tried to turn really hard, but since I was so wide I think I would have dumped the bike over the rumble strip. So, I decided my best bet was to just go straight, into the grass field. Fun, grass/dirt at 70mph. After a brief hairy moment, I slowed enough to feel comfortable, and headed into the pits, and up to point. I was told, "Your day's over," and that's all. No biggie, considering there was one to two laps left in the day. Bummer about the off road excursion, though. I guess I just got a bit too aggressive and expected the other rider to do something reasonable. I'll have to watch that... don't want to be going off the track on a bike (or a car for that matter, but stakes are higher here). The last track day of the year at PIR. 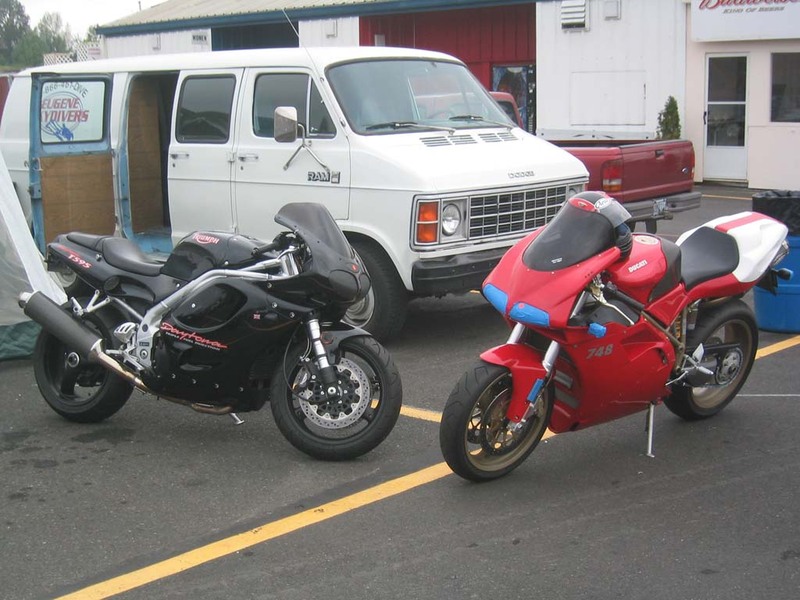 Again, a Moto Corsa day. I haven't done any other events, but these are very well run days. The emphasis is on maximum track time. Just from what other people were saying, it seems many of the other schools are much more strict, waste a lot of time, and just aren't as fun. It seems the Moto Corsa days also seem to have pretty experienced riders. The whole day was pretty much without incident for me. I only slightly scared myself once when I was running wide on the back straight (which isn't straight at all), but a little lift on the throttle brought things right back into check. Unfortunately many others didn't fare so well. 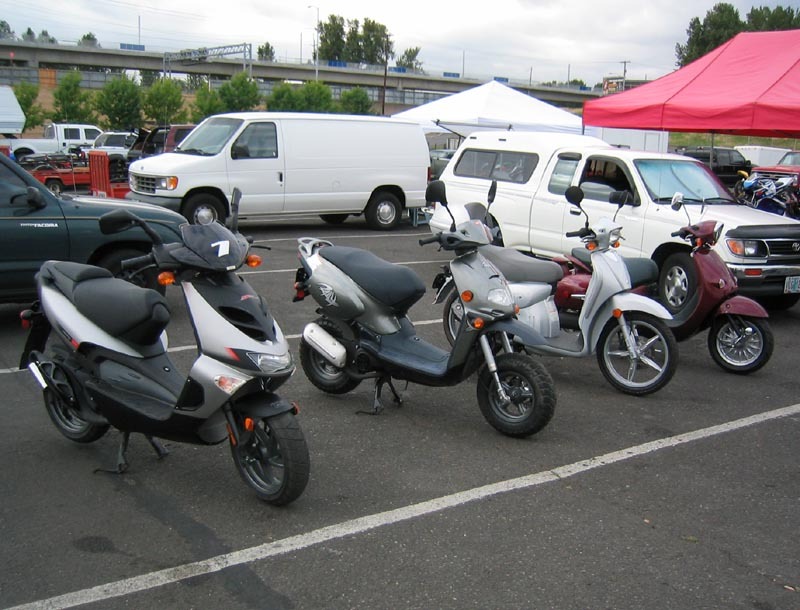 I think there were at least 6 bikes that got in pretty bad accidents, and two people with bad leg/ankle injuries. A 2003 R1 looked nearly totaled. Interestingly, most of the accidents happened in the C group, which is the beginner group. I guess people were just pushing things too hard too early. And I think I saw at least one person run off the track in each session. I personally had a blast. Best track day yet. Nice when they just get better and better. I may be reaching a plateau with my lap times, though. I noticed that most of the people faster than me in the B group were running on slicks, so I may be approaching the limits of where I want to go on street tires. I do think I can improve by at least a few seconds before then, though... I'm still working on various different things each lap. If I can string a few laps together with everything working at once I bet I can run a 1:22 or even 1:21. I guess we'll see next season. I bought this bike after thinking about getting one for a few years. I decided to get one after tracking my M Coupe and seeing how much fun it was. I wanted another (cheap) track toy, so a motorcycle seemed like the natural choice. 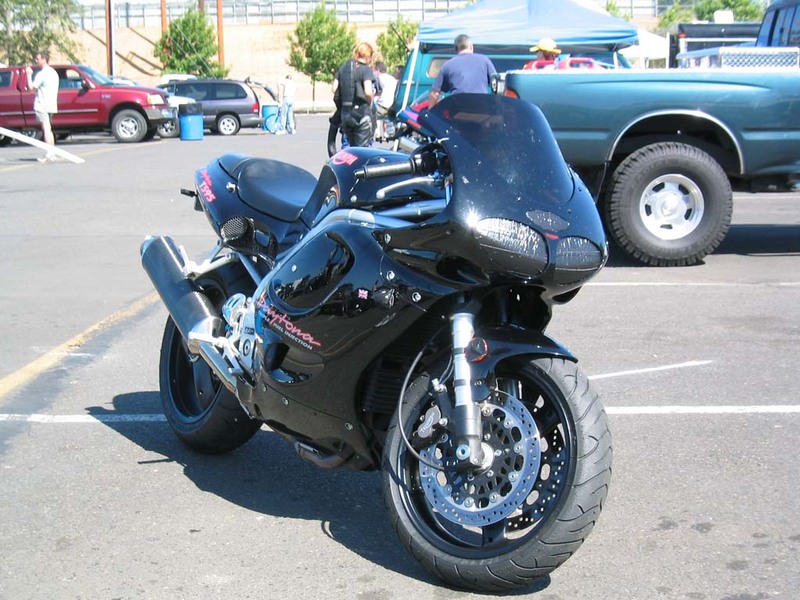 I look at this bike as a track toy first, and anything on the street is secondary. I've always been a car guy first, and a bike guy second, and I still am, but it seems I've progressed quite a bit quicker on the bike than I have in the car. I feel more relaxed on the track on the bike than I do in the car, too. I'm going pretty quickly, but it's all very calm and relaxing to me... it all flows very nicely. In the car, however, it's more of a constant struggle. It's interesting. Since my first bike track day I haven't done a single car day (not on purpose, just worked out that way). It will be interesting to see how I feel on the track in the M Coupe after doing three straight bike days.